The ITA Conference Centre in Randburg, Johannesburg, is a functional, well-appointed conference centre that caters for conferences, product launches, general meetings and business presentations. The ITA Conference Centre is a functional, well-appointed facility that supports the needs of the various ITA group committees. Members benefit through access to some of the finest facilities available at an affordable rate. The venue is capable of catering for conferences, product launches, annual general meetings, business presentations, Christmas functions etc. Full contract catering facilities and menus to meet individual requirements including kosher, vegetarian and Halaal are available on request. The on-site kitchen facilities, cutlery, crockery, table linen are standard and form part of the service provided. Companies requiring special corporate touches can liase with the ITA Conference Centre Manager, to make the necessary arrangements, or utilise their own staff to incorporate the finishing touches to their own particular functions. The ITA‘s progressive attitude in providing the most effective services for their members is evident in their strategic alliance with independent conference and event specialists, marketing and communication organisations and human resources training professionals. Continuous communication with our own members able to supply the latest information and advice in the Information Technology field gives us the unique ability to offer a full service to any of our members looking to stage any type of event, conference or in-house training program. Sourcing international speakers, staging multimedia presentations, workshops, product launches, celebratory functions... anything is possible. Simply call the ITA and we will arrange a meeting to take your specific brief and provide you with a comprehensive quotation to meet your needs. Ergonomically designed with multiple configuration capabilities, the ITA Conference Centre is able to comfortably cater for two simultaneous boardroom (seating 30) or classroom-style (seating 40) conferences. Cinema-style presentations cater to audiences of 120, in total exclusivity with the latest presentation equipment available for hire should the standard equipment supplied not suffice. Full multimedia facilities, confidential secretarial and message services are available on-site with privacy top of the priority list. Cloakroom facilities, an equipped kitchen and buffet-style service area caters admirably for open-plan functions and cocktail parties of up to 180 people. Through glass sliding doors the reception area adjoins the private garden patio with its built-in braai. The self-contained ITA Conference Centre has been designed to offer maximum flexibility and access with fold-away sound-proofed partitioning, modular furniture and movable presentation screens and whiteboards. 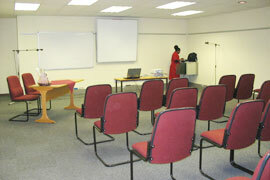 All conference rooms are air-conditioned with independent controls. A message service is available and instruments are monitored by trained secretarial staff. Research has confirmed the demand for facilities able to cater for the medium to smaller number of conference delegates, with the emphasis on business with minimum disruption.